The mission of the Preservation Lab is to preserve and conserve the collections of the Public Library of Cincinnati and Hamilton County and the University of Cincinnati Libraries – a collaboration begun in January 2012 to provide conservation and preservation treatments in an equally managed, staffed and equipped preservation lab on the University of Cincinnati’s campus. 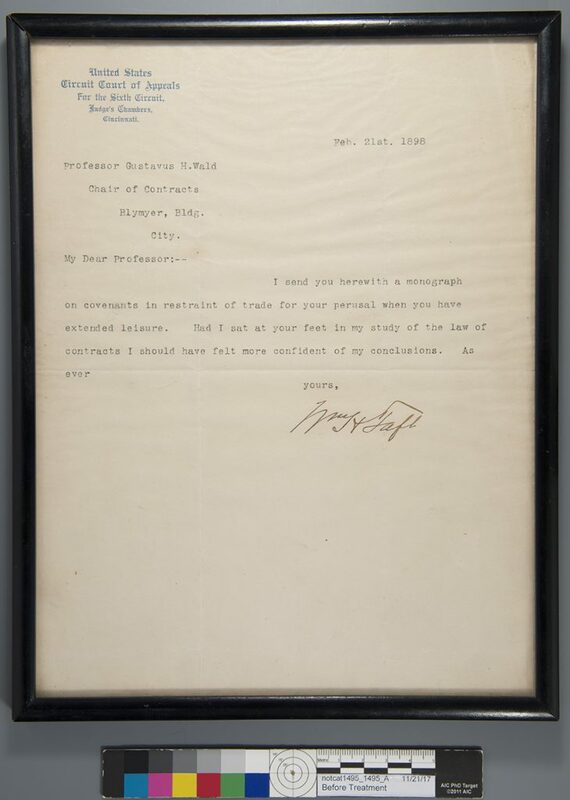 A recent collaboration with the Archives and Rare Books Library on a collection of letters and artifacts pertaining to William Howard Taft demonstrates the valuable role the Lab takes in both preserving a collection for posterity while also making it available for study today. Conservation – interventive treatment to prolong the life of an item. A conservator may introduce new materials and adhesives, conduct an examination, and write a treatment proposal and report to document any changes to the historical nature of a material. Preventative conservation – non-interventive treatment that includes rehousing in a protective case or covering, conducting environmental monitoring, undertaking insect pest management, protecting materials from fading while on display, or creating surrogates. A few months ago, a wonderful trove of UC history came to the Archives & Rare Books Library from the College of Law. Eira Tansey, university records manager, facilitated the transfer of several boxes that documented the days of the Cincinnati College and the teaching legacy of William Howard Taft. The Cincinnati Law School, of which Taft was dean and professor, was the last remnant of the Cincinnati College founded in 1819. Among the materials in the collection, there are Board minutes of Cincinnati College from 1847-1918, Taft’s teaching assignments, and a series of letters between Taft and Gustavus Wald, the law professor who succeeded Taft as dean in 1900. As is customary upon receipt of new collections, the items were sent to the Preservation Lab for examination and necessary treatment. Ashleigh Schieszer, lab conservator, surmised that the majority of the items were in need of preventative conservation so that they could be protected and available for research and classroom use, as well as to provide digital access through digitization. Some of the letters appear to be typed with a dye-based ribbon ink, and as a result, the ink is fading. To protect the fugitive text from further light damage and handling, the letters were removed from their frames and encapsulated in plastic sleeves and inserted into a new custom binding created by Chris Voynovich, conservation technician. Standard procedure for most items that come to the Preservation Lab is for Jessica Ebert, conservation technician, to photograph them both before and after to document the pre-existing condition and the results of treatment. In the case of the Taft collection, each letter was photographed recto and verso in normal illumination, first within the frames they were originally housed, and then unframed. As is common in photographic documentation, Jessica used transmitted light (light below the object) to illustrate any watermarks that she encountered. 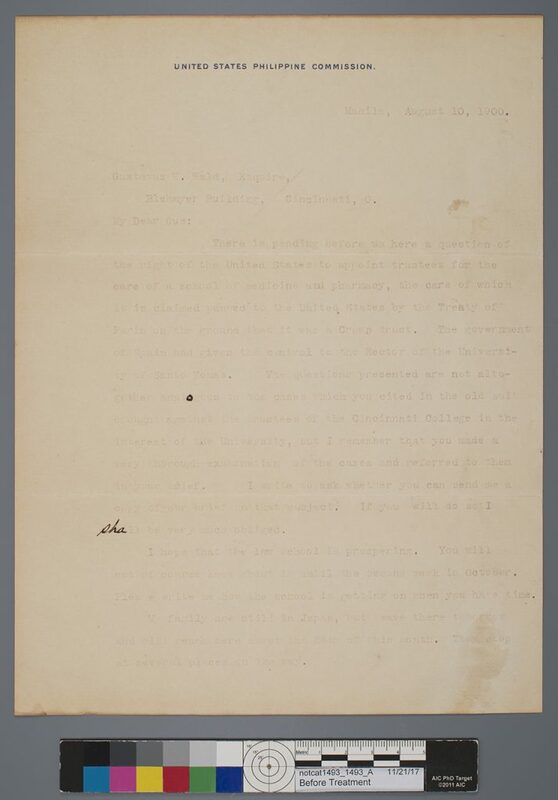 The Taft letters presented a not-so-typical instance where additional photographic documentation was required in order to decipher the text on some of the letters where the typewriter ink had severely faded and the text was nearly impossible to read. In this case, Jessica used raking illumination to illuminate missing text. To do so, she placed a light to the side of the object to create the raking illumination, so called because the light rakes over the surface of the object and creates shadows where there are deformations and anomalies in the surface structure. And low and behold, success! The raking illumination provided the best illustration of the text that along with the normal illumination offered a fuller, more readable picture of the letter as a whole. The photographs were printed and included with the letters in their new encapsulated binding to show the original acidic frames they were housed in, as well as the watermarks made visible using the transmitted illumination. Reflected infrared photography was used in an attempt to accentuate the faded ink, since it was originally thought to be carbon-based ink, common for typewriter inks; however because the ink completely disappears with infrared we know that it is most certainly not carbon-based ink. 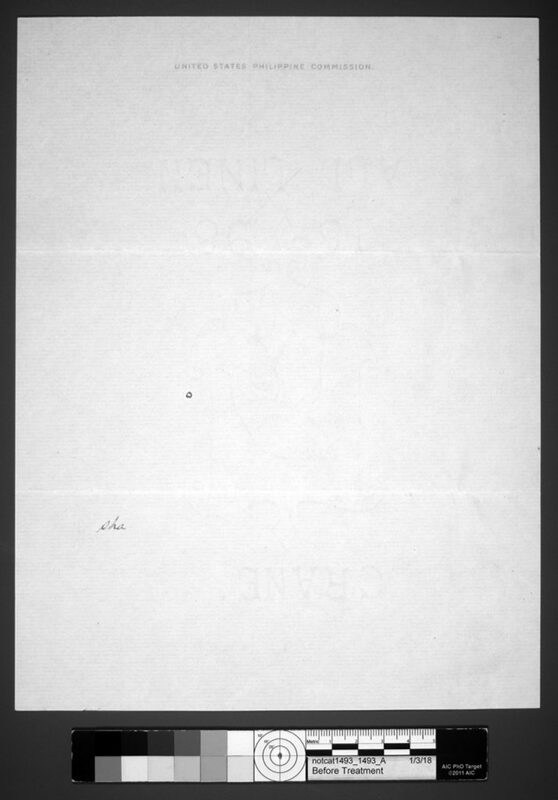 An unframed letter where the typewriter ink has faded significantly, especially compared to the handwritten correction in the lower left section and the stamped letterhead. One of the more interesting group of items in the collection resulted in a final product that can be seen on campus today. Included are photographs and drawings by William T. More III, the sculptor who created the Taft statue dedicated in 1992 and that stands on the east side of the College of Law. The drawings were produced using a type of diazotype print, a compound decomposed by ultraviolet light that can harm other materials in addition to itself. To safely house the drawings so that they can be viewed but kept away from other items, Jessica created an encapsulated binding where the diazotypes are sandwiched between two layers of polyester film and then welded along all four edges of the page using an ultrasonic welder. The encapsulated pages are then sewn and inserted into a cover that will protect the drawings from light damage. Ashleigh Schieszer works on Taft’s maquette. Along with the sculpture drawings, a part of the supporting documentation includes a maquette, or clay model, of Taft’s head, which provided another challenge. The maquette is aging poorly and in need of treatment and preservation storage. A reddish-orange, oily accretion is oozing from the interior of the putty down to where the rod stand is secured into a wooden base. To protect the maquette, and to keep its ooze from damaging other materials while more research can be done on its origin and composition, Ashleigh mechanically removed excess ooze to monitor the maquette’s condition while on exhibit. During treatment, she noted the accretion exhibited oobleck properties, a sticky fluid made of cornstarch and water with properties similar to Silly Putty and named after the substance in the Dr. Seuss book Bartholomew and the Oobleck. The viscosity of the ooze thickened to a waxy state when pressure was applied with a tool. While at rest, the accretion appeared to melt into a liquid-like form. 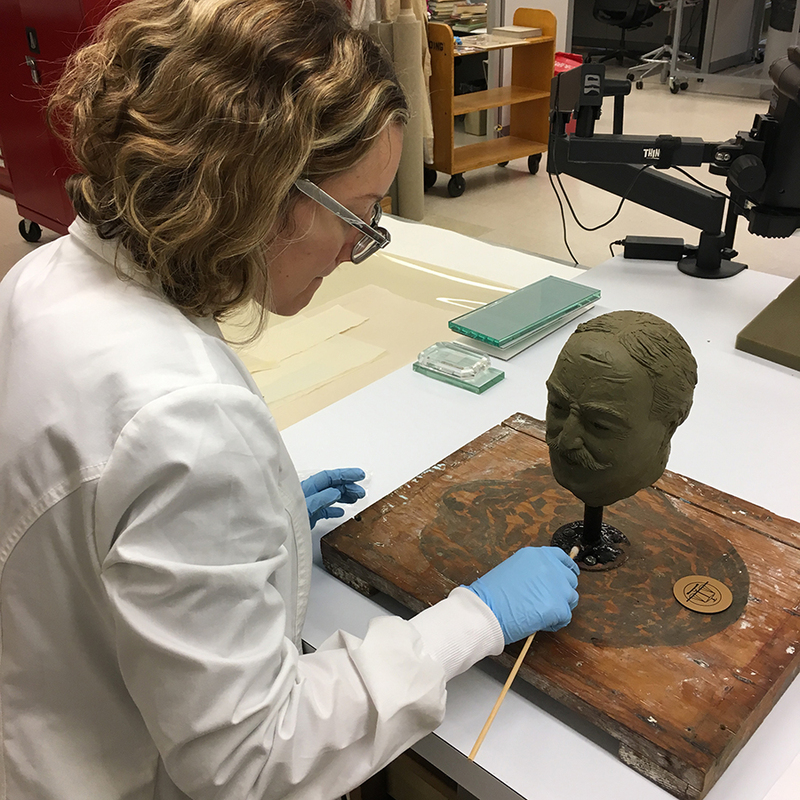 To protect and support the weight of the sculpture during storage, Ashleigh re-purposed a sturdy plastic bin and constructed a breathable archival lid to allow Taft’s aging head to off-gas during storage. Read more about the maquette at http://blog.thepreservationlab.org/2017/10/a-tale-of-a-preservation-horror-the-mystery-of-william-howard-tafts-oozing-head/. Once final preservation work is completed, and an archival finding aid is developed by the Archives & Rare Books Library, the entire Taft collection will be available for research and study. As evidenced by their work with the various items in the Taft collection, working in the Preservation Lab requires the combined skills of an engineer, researcher, chemist, photographer and artist; but most importantly, it requires dedication to preserving and making available to scholars worldwide the rich and amazing collections available at the University of Cincinnati Libraries. Want to know more about the fine work done in the Preservation Lab to protect and make available the collections of the Public Library and UC Libraries? Attend the Preservation Open House on April 26, 1:30-3:30pm, 300 Level of Langsam Library. At the Open House, meet Lab staff and learn more about what projects they are working on.